An MBA can still be a valuable program for people that want to progress their business career. And for aspiring entrepreneurs. However, there are some fundamental aspects of MBA programs that make them too risky for today’s standards. 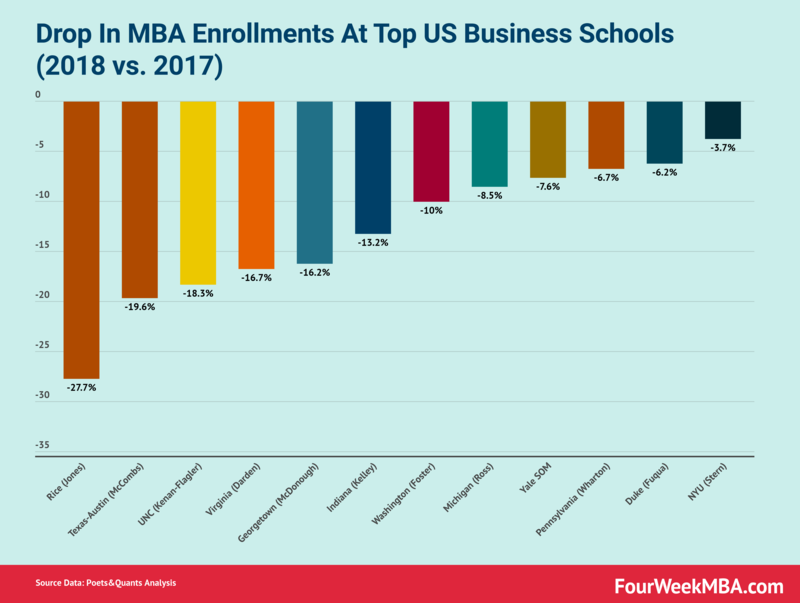 As the business world changes at a faster and faster pace, the opportunity cost associated with enrolling in an MBA program has become too high for many people to bear. A good chunk of this sharp decline seems to be related to a drop in international applications. As reported on Poets & Quants part of the fall is due to less friendly immigration policies and the political rhetoric of the Trump administration. As those issues have become more and more incumbent, we have also assisted in the last two decades to the increase of e-learning platforms that provide quality business content, that before could be hardly found. For instance, a company like Lynda, founded in 1995, managed to put together a rich library of business educational content. To have a bit of context on the market value of those platforms, Lynda.com was acquired by LinkedIn, back in 2015, for $1.5 billion. LinkedIn itself was acquired by Microsoft, in 2016, for $26.2 billion. Part of that valuation was undoubtedly driven by the presence of this e-learning platform, which made it LinkedIn overall business model way more valuable to Microsoft. Another e-learning platform, Udemy, received over $173 million in funding, which is competing with other e-learning platforms, like Coursera, which secured over $210 million in funding. And Udacity, which received over $160 million. Opposite to the traditional MBA program, those platforms attract practitioners, as well as academics willing to make an extra buck while providing education, with a practical approach. In other words, those platforms are more focused on offering content that is highly tied to the real business world. Has the way people conceive business education changed? There is no doubt that we’ve assisted to a massive switch to the way that business education is conceived. That hasn’t happened overnight. However, it has changed quickly in the last two decades, with the rise of digital businesses. Indeed, where a business education in the 1980-90s was the key to be trained to become a “corporate person.” However, while back then being a corporate person made sense as the career switch weren’t so frequent. Whether this is true or not, as people follow the money, or at least they think, this sudden career changes might also lead to a lack of leadership in the business field. Indeed, trust and leadership are two critical elements of the business world. And apparently according to a survey conducted in 2017 there is mismatch and communication breakdown, between managers and employees. Where 80% of managers claim to be transparent in their direct reports. Where employees instead only 55% of employees perceive that managers have been transparent in their reporting. New digital companies and Startups require years before they could build a brand, or before they could really find a product-market fit. This requires strong leadership among business people. Is an MBA still worth the investment? However, if this is true for top schools, can we say the same for other, less prestigious schools? Yes and no. Thus, you want to make sure that for your business education you either prioritize on networking, or you go all in with education and knowledge. If you’re looking for the latter, then an online MBA might be the most viable option! We’ve put together a list, which will be updated by time to time comprising institutions that might offer the online MBA as an option. This list is not definitive, it will be updated constantly, so feel free to send us your suggestion if you want us to enrich it.